Today I traveled from Snellville to Alpharetta for the last time as an employee of BIS Benefits, (BIS). Today, I walked out the door of Suite 250 at Westside Center with a void in my pockets where office keys once belonged. The walls of my office now lay bare–the pictures of my family, the artwork of my kids, my 24-hour clock and the painting of Elizabethton, Tennessee’s Covered Bridge temporarily encased in bubble wrap. Julio Jones’ head bobbles no more in, what was, my office. I’m no longer an employee of BIS. I will forever be grateful for BIS giving me the chance to work in “business.” I had been told by many I would not be able to make the transition from 19 years of serving on church staffs to business. I didn’t want to believe it was impossible. Therefore, I continued to network in search of a new job—and a new career. Doug Hunter was a good friend who suggested I speak with Don, an executive serving on staff at one of Atlanta’s largest churches. Don was gracious to meet with me and then said something that provided a tinge of hope, “You know, our broker is looking for someone like you.” He made a call. I had an interview. An interview? The truth is I had at least five. I passed the initial test with Lisa Owen and Kim Roettger who recommended I meet with Ray Bachman, the owner, founder and president of the small employee benefits firm. After a rigorous set of interviews I was hired as the Operations Manager of Bachman Insurance Services, (now BIS Benefits). I was in business. I have a lot of people to thank for making that transition, but none more than Lisa, Kim and Ray. They took the time to look at a preacher and say “maybe.” They were the ones willing to entertain the thought I might just have transferable skills useful to the employee benefits industry. They were the ones who listened as I valiantly likened the leadership role in a church to the leadership needed in business. They were the ones who took a chance and extended an offer. Thank you, Lisa. Thank you, Kim. Thank you, Ray. Thank you for giving me a chance to have a seat on your bus. THANK YOU! While I look forward to the new challenges and opportunities that come with the new job, with the new comes loss. Friendly Suzie at Pilgrim Cleaners has handed me my dry cleaning for the last time. Juan will no longer be a familiar face on Moe Monday. Dreamland BBQ is no longer just a mile up the road. I’ve said goodbyes to my early morning workout buddies, Coach Debbie and the front desk staff at the Alpharetta YMCA. And while I am sure I will make an occasional trip back, I’m going to miss the Alpharetta Big Creek Greenway where I have worn-out multiple pairs of Mizuno running shoes while logging 2,000 miles training for races or simply getting in a workout. The most difficult part of parting—the deepest loss in saying goodbye—is leaving the friends who were first known only as co-workers. 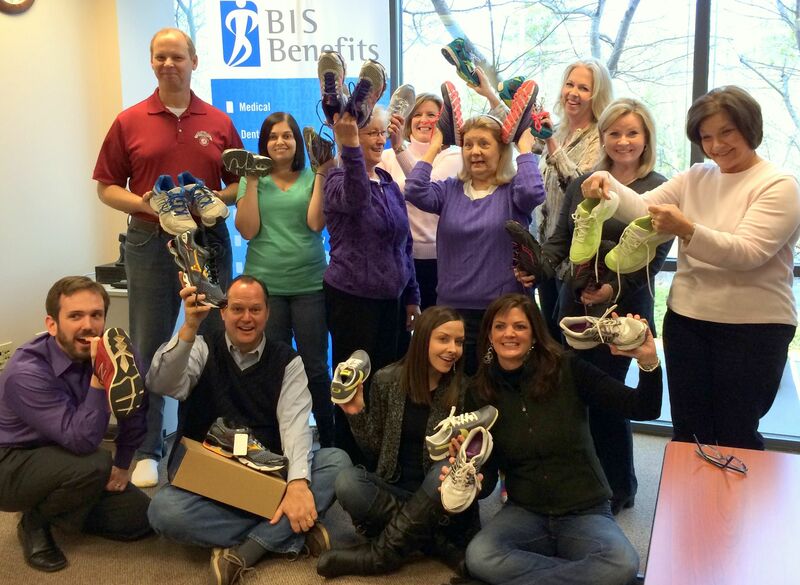 The team of folks that make up BIS Benefits are a special people who will always reside in a warm spot in my heart. There have been times when I have driven some of them crazy. I’ve made some blunders—and not always of the minor variety. Yet, each time I’ve been forgiven, accepted and welcomed back. I’ve implemented unwelcomed policies and had to be the news-barer in seasons of uncertainty. Together we endured several restructurings and the moving of the cheese. Together we rallied around a beloved coworker as she battled the disease that would take her life. Together we weathered the double punch of healthcare (insurance) reform and the recession. In my office, tears have been shared, happy events celebrated, prayers prayed, strategies formulated and dreams weighed—and it wasn’t always business. We shared our lives, our ups, our downs, our families, our sports teams. We did the stuff friends do. Counsel, advice, listening—it went both ways; I often the beneficiary. Therefore, when it comes to “thank you,” my deepest gratitude goes to the team with whom I was privileged to be a member. I’m going to miss my friends, …but thankful we had the opportunity to be more than coworkers. *An upcoming blog post will announce the new landing spot on this journey called employment. Well spoken Jack, best of success in your new chapter! Best goodbye EVER. Jack, you’re a class act always thoughtful and kind! Thank you Holly for your kind words. What a lovely testament to your time there, the folks you spent your days working alongside, and the closing of a chapter. Not to mention the payoff that can happen when you consider someone outside a particular field for an opportunity. Best wishes for the next chapter…. Jack, I can only anticipate great things for you. BIS is a great organization… Ray and I go back maybe 30 years… I can’t wait to see where you land.